I love learning. It’s ingrained in everything I do as I seek new ways to develop as a person and a leader. I’ve had the privilege of traveling the world to attend incredible keynotes and conferences that have aided me in my pursuit. However, even with technology assisting us getting the content we desire, I remain steadfast on this simple statement; nothing beats a great book. There’s something extremely intimate about reading. It’s different than watching videos (which I do often) or attending a seminar (which I also do often). When reading a book you are in your own little world, where your inner voice is the one you hear and where you are able to take the time to digest and relate at your own pace. My favorite books to read are those centered on culture and leadership themes. I gladly line up at my local bookstore or preorder the latest release to eagerly absorb the pearls of wisdom contained within. I’d like to share a couple of my favorite books and why they are important to me. First up, is Start With Why by Simon Sinek. 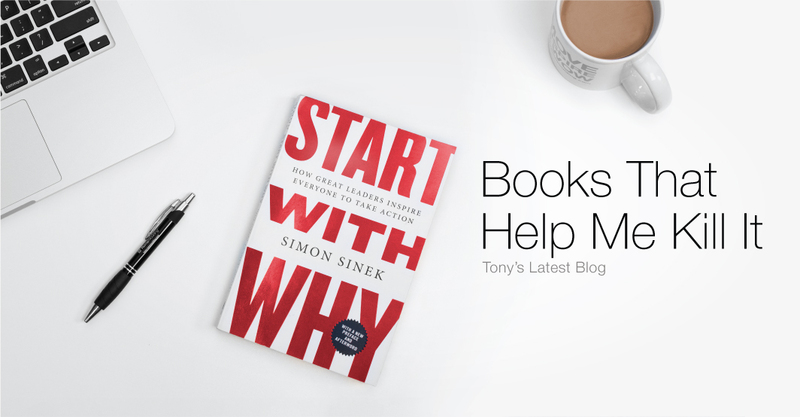 It seemed logical to start with Sinek’s first book as it has had a profound impact on me. Before he was one of the most watched TED Talks presenters in the world (I invite you to watch his video), Sinek taught us about the Golden Circle and why some leaders and organizations inspire us and why others do not. This is an important book because entrepreneurs need to focus on the why. The Golden Circle, Sinek explains, is a way of planning your business that turns the traditional model on its’ head. Typically, business will identify a service or product that they feel will be consumed and begin to produce and market the product or service. What they’ve done is identified the what – what consumers or businesses will buy from them. Sinek implores us to instead focus on why someone would purchase your product over a competitor’s. “People don’t buy what you do; they buy why you do it,” Simon Sinek. At Roma Moulding, we sell picture frames but so do many other manufacturers across the globe. So why would someone buy from us? Is it because we’re the cheapest? No, in fact while offering an incredible value, our mouldings are more expensive than others because we support handmade European and North American artisanal manufacturing that simply cannot be achieved at a lower price point. People buy from us because they believe in our mission to Move, Inspire and WOW the world and are aligned with our Core Values. We do this in many ways including spreading happiness through unique means, as well as our philanthropic efforts (please check out our latest endeavor, Roma Wish Mission: Haiti). My personal take on this is: Don’t do business with people who want what you have. Instead do business with people who believe in you, your values and your why. Anybody can make anything but the why will be very different from business to business. “When you start with why, those who believe in what you believe in are drawn to you for very personal reasons. It is those who share your values and beliefs, not the quality of your products that will cause a system to tip,” Simon Sinek. Our team doesn’t enthusiastically come into work everyday because they are in love with 2’ X 4’ ‘s, well some of them might be. No, they come because they believe in our why. They know that we’re out to change the world, our vehicle just happens to be picture frames. A refined why can extend far beyond a business model and can be applied to other areas of your life as well. For instance, my personal why is to enrich lives, drive happiness, inspire greatness, challenge the status quo and to make this industry great. Your why can be altered over time and don’t think it’s too late to change course and create a powerful why. My father, John, started Roma Moulding because he needed to feed his growing family and wanted to bring great products to the market. That is why but is it a compelling why? It worked very well in the 80’s and 90’s but would no longer cut it in today’s marketplace. In a world where we have one second to capture someone’s attention, ask yourself will your why do it? What is your why? Stayed tune as in my next blog, I’ll explain why I love two other of my favorite books, Good to Great by Jim Collins and The Presentation Secrets of Steve Jobs by Carmine Gallo. Great read and I love the video! A truly inspiring story and a great guideline to everybody who wants more than an ordinary life. Such a simple concept but very powerful ! Thank you Tony for your inspiring blogs! So many times simplicity is more! Thanks for always keeping it interesting, Tony! Another terrific Blog Tony! The more you pass on to others the more you keep for yourself! Keeping it simple with an edge, I like that!! Studying our internal why certainly provides great perspective.